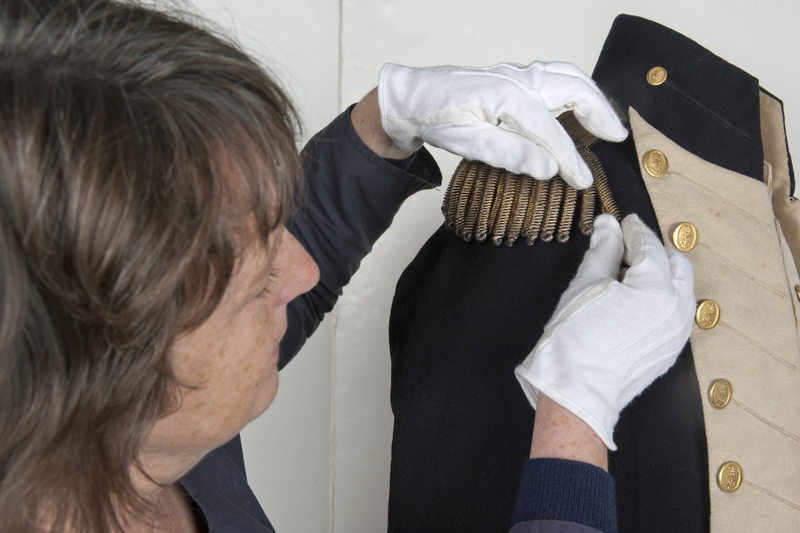 This piece by Peter Warwick of The 1805 Club describes his discovery of one of the most extraordinary artifacts of naval history recently found: the only known Napoleonic era naval lieutenant’s uniform! 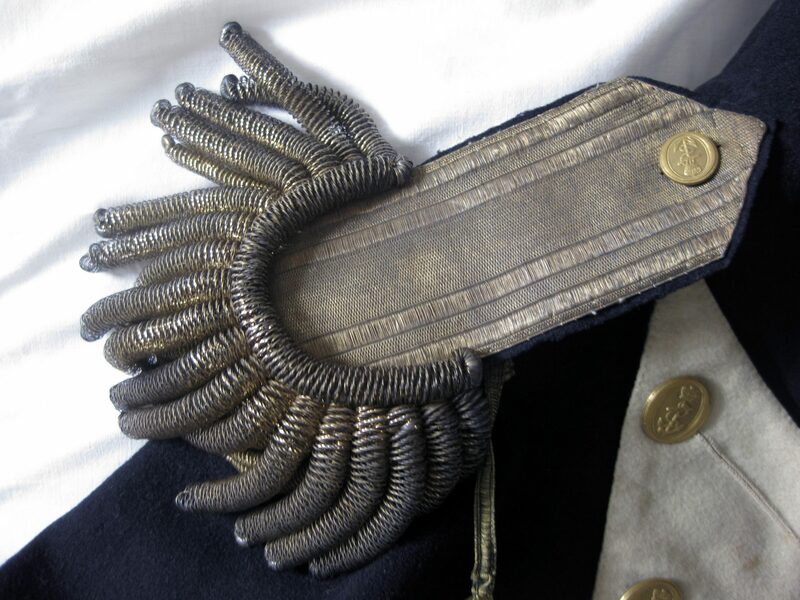 If a few years ago I had been an expert on the Antiques Roadshow and had been asked what important naval item I came across most often, I would probably have said the Naval General Service Medal 1847. 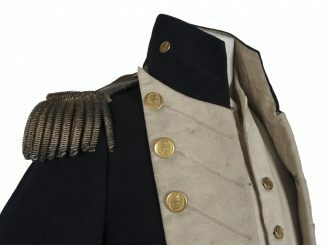 If I had then been asked what I would most like to find I would have almost certainly replied a lieutenant’s uniform pre-1825 pattern, and preferably one which belonged to a Trafalgar veteran, as none were known to exist. However, this was not on my mind on 1 September 2009 when a very nice lady came to speak to me at the Express Inn, Kew Bridge. The occasion was the unveiling of another Trafalgar Way plaque marking the route taken by Lieutenant Lapenotiere to the Admiralty with Admiral Collingwood’s Trafalgar Dispatch, 6th November 2005. The event was winding down and most people had left. Bill White, Club vice chairman, and I were dismantling the exhibition displays. 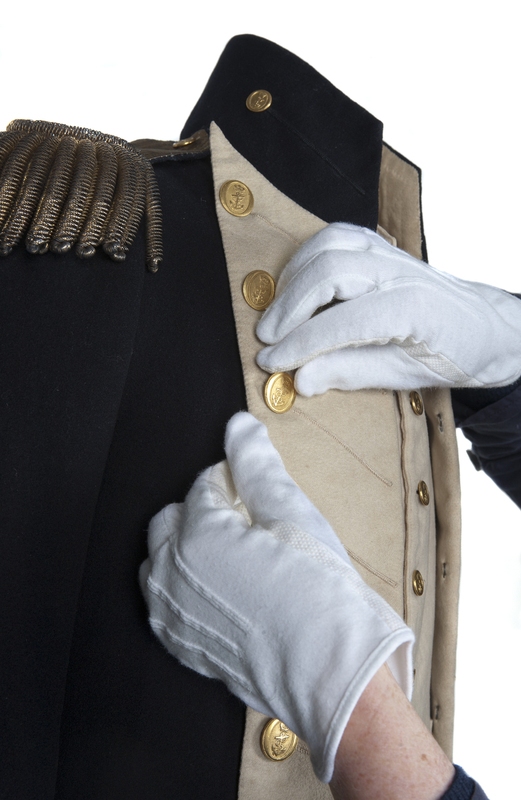 It was then that the lady approached and said simply, “Excuse me, but have you seen one of these?” In her outstretched hand was nothing less than a Naval General Service Medal with a Trafalgar Bar. 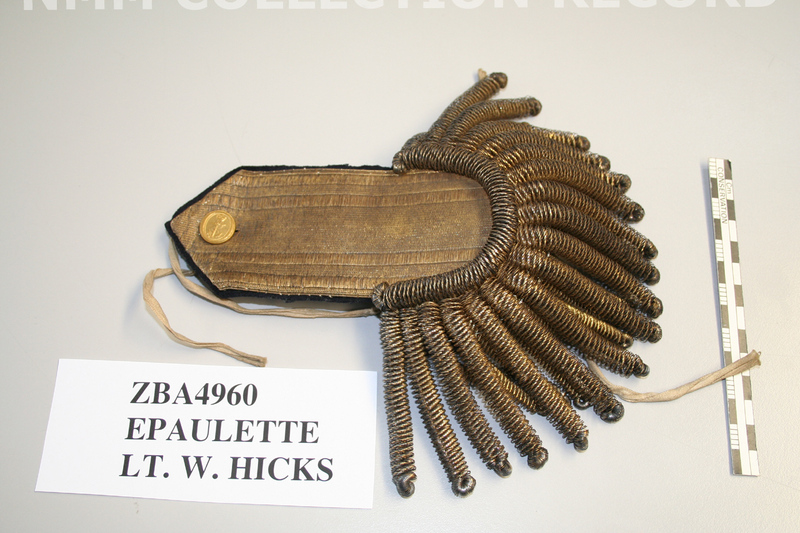 I recognised it instantly and a little shiver went down my spine when I looked at the edge and read the name: Lieutenant William Hicks. I knew of him! 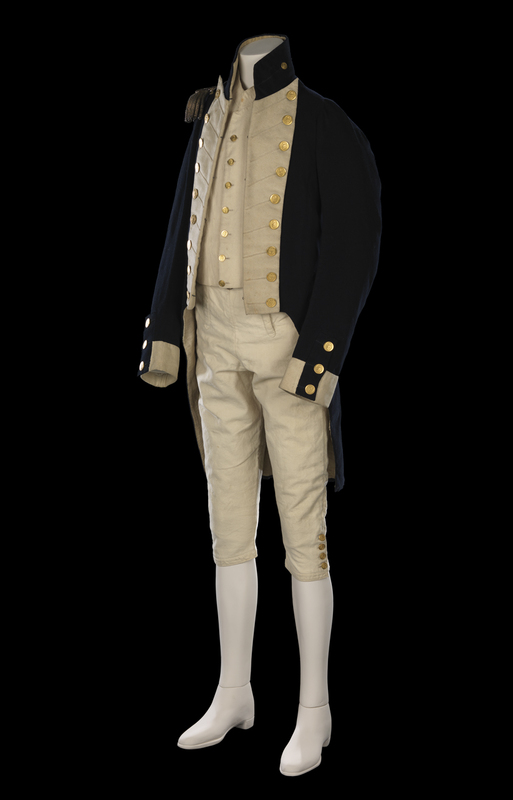 In fact I had quoted him in my book, Voices from The Battle of Trafalgar. 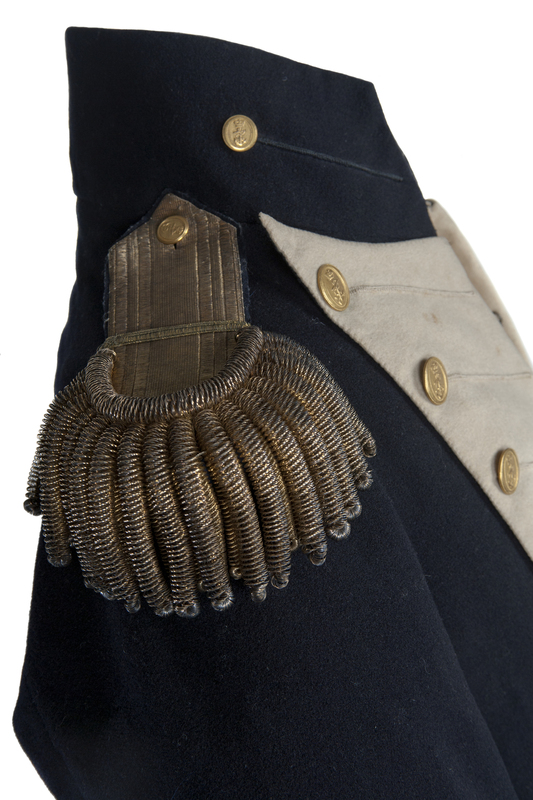 Hicks was promoted lieutenant and left the service in 1819. He went up to Magdalene College, Cambridge and studied for the ministry. A member of the local historical society the woman appeared pleased that she could share her enthusiasm for the medal with someone else, but she did not know much about it and had no idea of its value. I naturally asked how she came by it and was thrilled to hear that it was a family heirloom and that she was descended from Hicks himself. A few weeks later Bill and I visited this nice lady in her London flat and met her equally charming husband who has a passion for Mediaeval history. 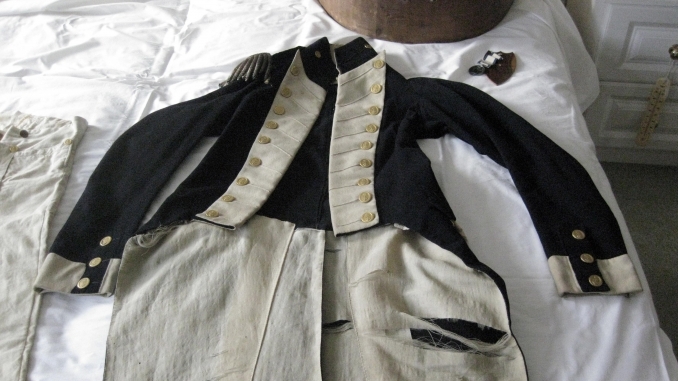 They showed us into their bedroom to see the uniform coat laid out on the bed. It was not alone! 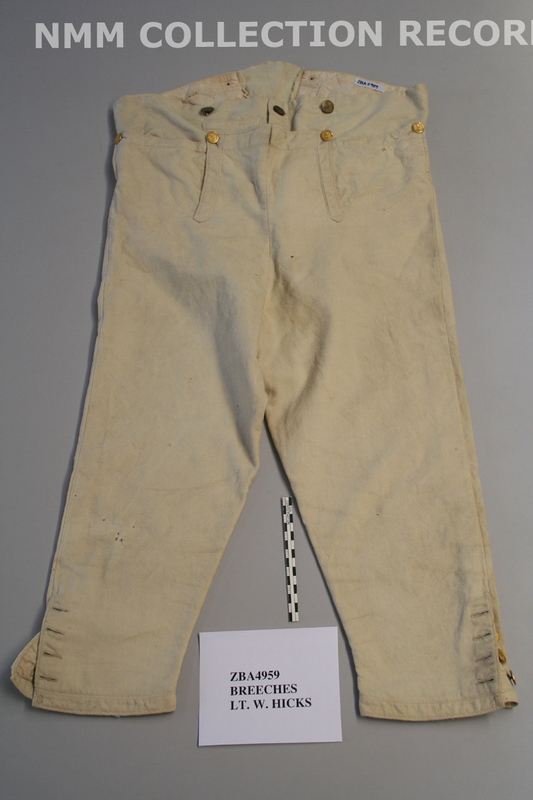 Next to it were a pair of breeches, a waistcoat, an epaulette, a wooden hat box, and the log book and passing certificates. I don’t know about Bill, but I felt like Howard Carter as he peered for the first time into the tomb of Tutankamun. “There are some marvellous objects here”. 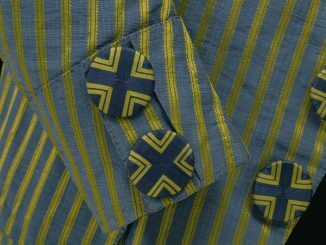 Looking more closely at the garments it was clear they were in a remarkably good condition and with only a few moth holes. 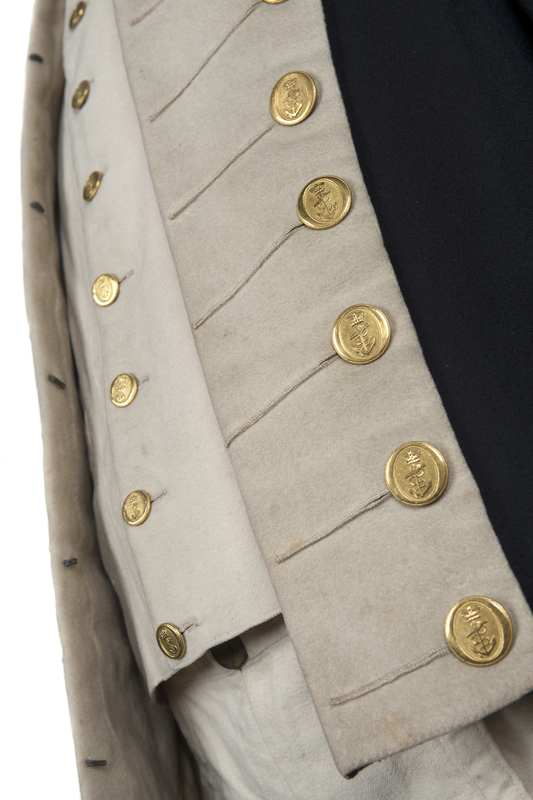 Moreover, every button was present and they were to my best knowledge the pattern used during the Napoleonic Wars. 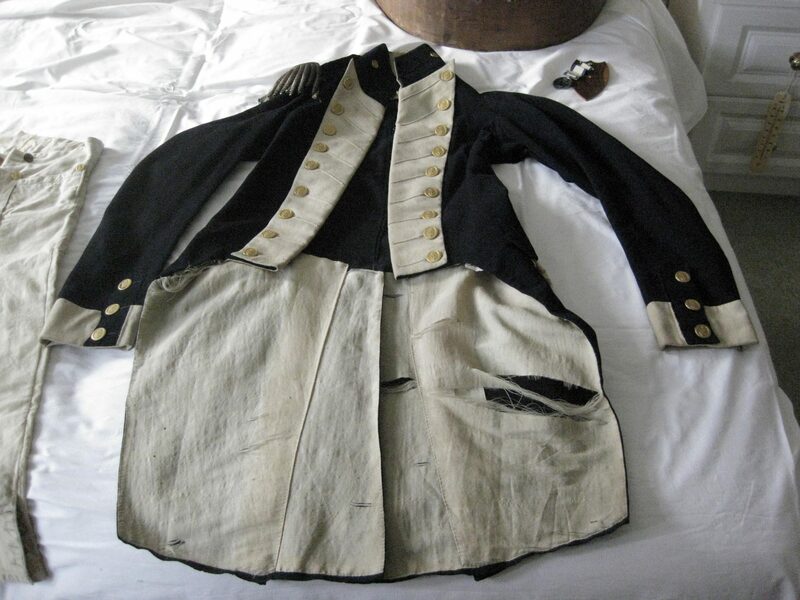 This find was worth taking further and so, through The 1805 Club, Bill and I arranged for Keith Levitt at Henry Poole, Savile Row, to pay a visit to what had now become a secret location in west London! 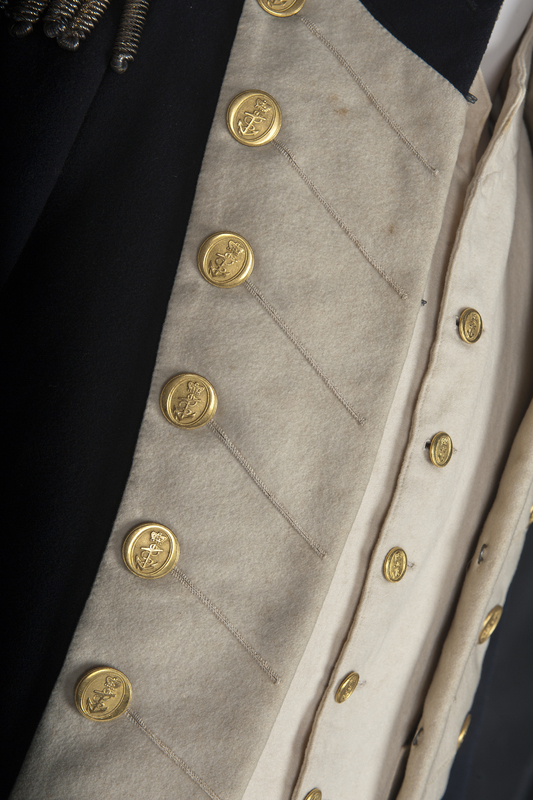 Keith has superb knowledge of 18th century naval tailoring and made the splendid replica ‘Trafalgar Uniforms’ that were worn during the bicentenary by Alex Naylor interpreting Nelson and Alex Price playing the role of Lieutenant Lapenotiere throughout The New Trafalgar Dispatch. 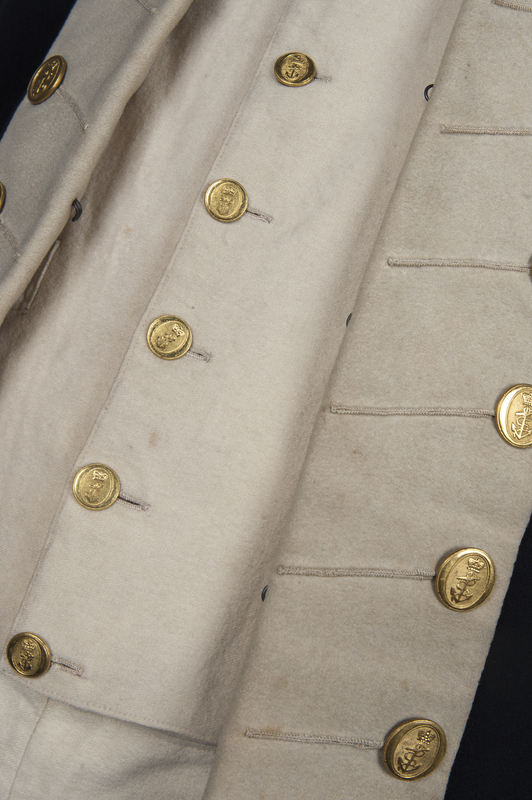 Keith’s immediate reaction was, “This is definitely genuine, and I can see what I got wrong with Alex’s coat!” The significance of the last few words was telling, because when Keith made Lapenotiere’s uniform he did not have a coat to copy. 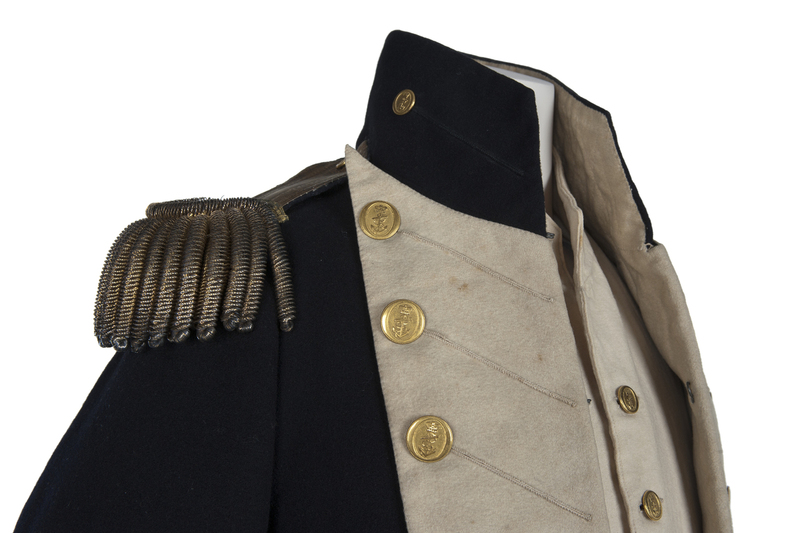 The 1805 Club had just found the only known surviving example of a lieutenant’s uniform of the Trafalgar period anywhere in the world! 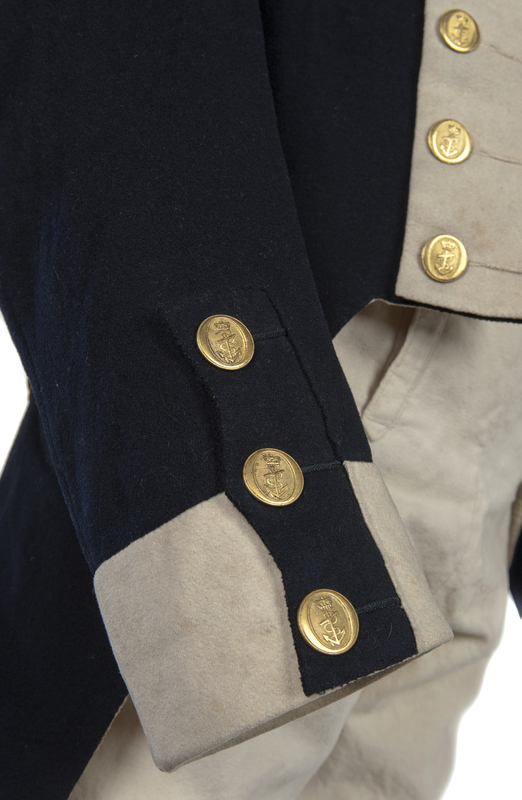 Moreover, it is the pattern worn by Royal Navy lieutenants throughout the War of 1812, which we commemorate next year. 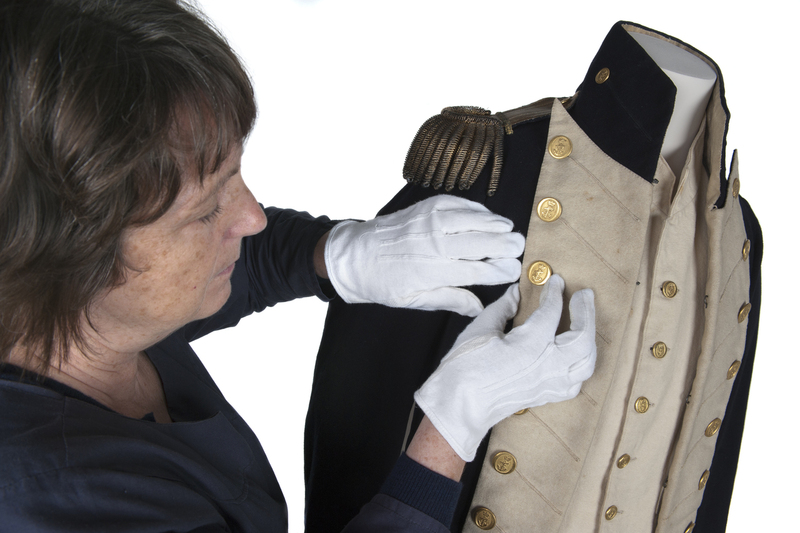 There was now an urgency to show it to the experts at the National Maritime Museum for their formal opinion, and the Club arranged a visit to the secret location for Amy Miller, Curator of Decorative Arts and Material Culture, Quintin Colevile, Curator of Naval History and conservator Nicola Yates. It was a joy to relive our own excitement through their enthusiastic reactions as we saw their eyes also fall upon these ‘marvellous objects’ for the first time. 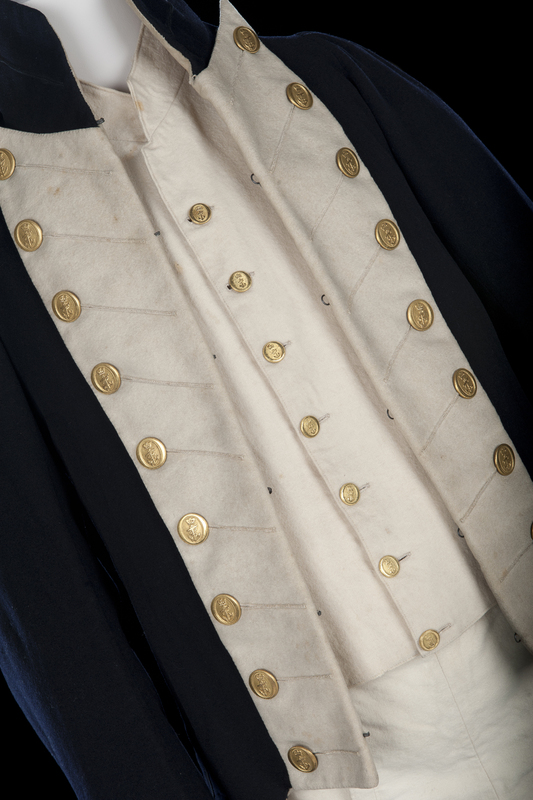 The uniform was indeed genuine and incredibly well preserved. 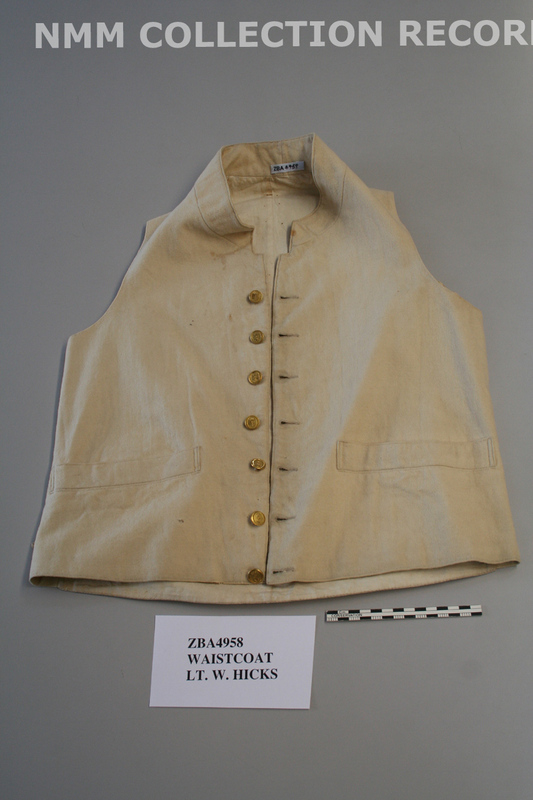 As Keith had confirmed from the beginning, the coat had not been cut as the family had thought. 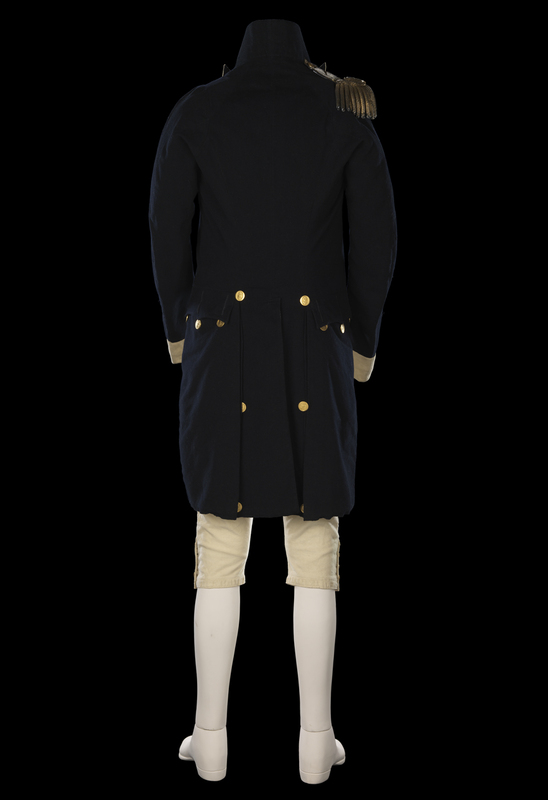 It was perfect and the individual style even suggested that Hicks was a follower of fashion! 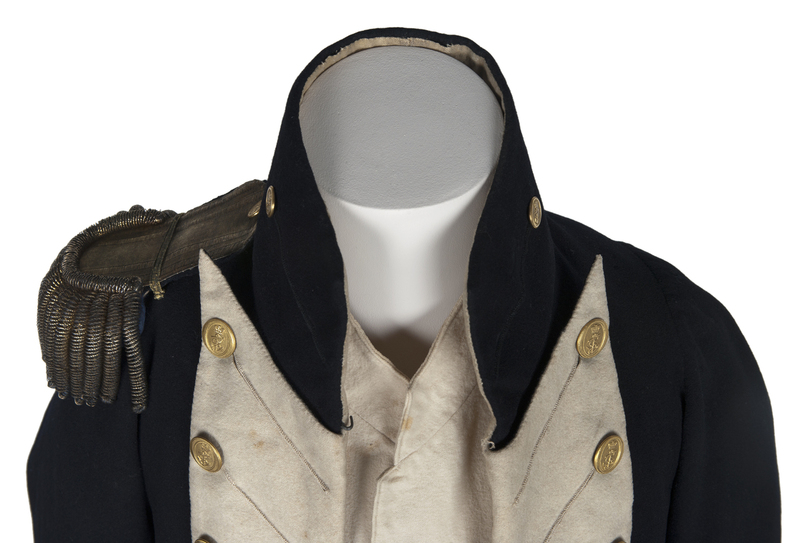 Nevertheless, while an incredible survival it was in urgent need of conservation. It had been rescued just in time! 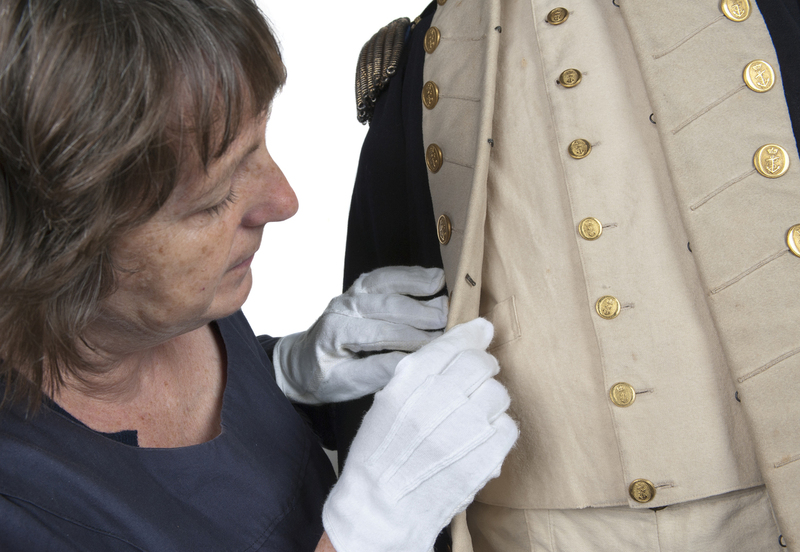 The 1805 Club helped to broker the arrangement whereby the family generously and graciously presented the uniform garments to the National Maritime Museum, where they are now safely preserved in a stable environment awaiting conservation. 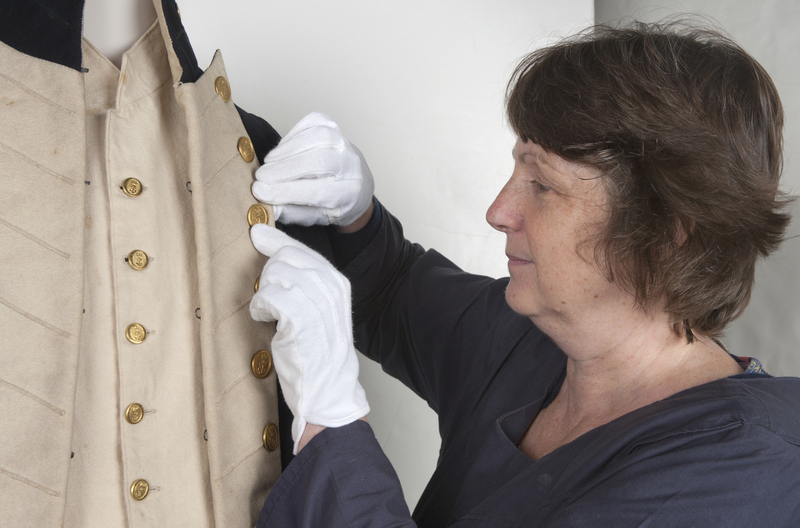 They will go on display in the new 18th Century Gallery, which opens in 2013. 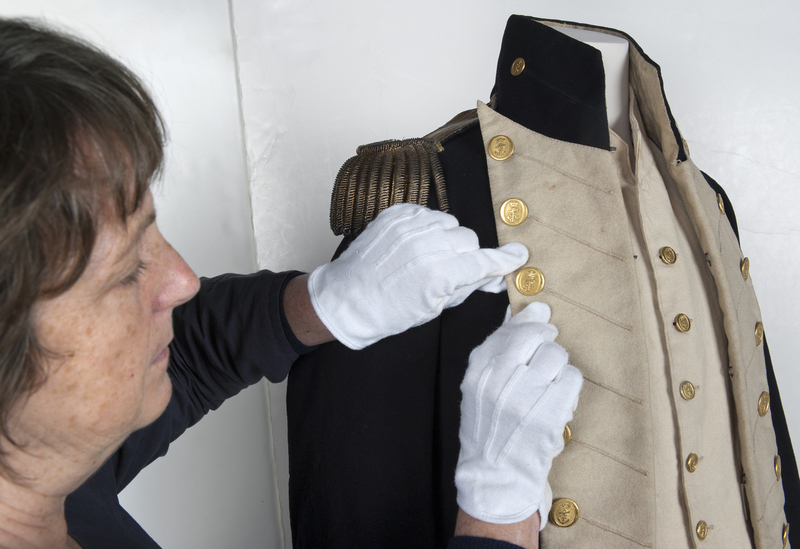 Nelson’s Trafalgar coat is also undergoing conservation, and both uniforms will be displayed in close proximity to each other as permanent exhibits. 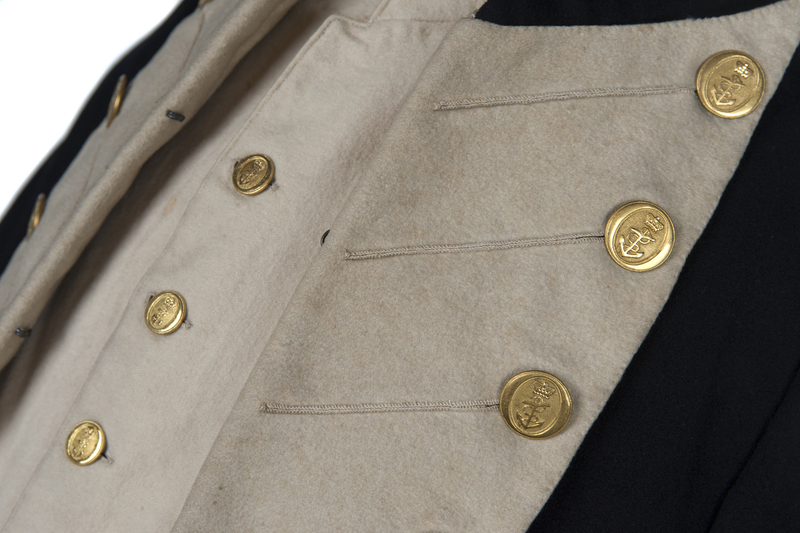 The 1805 Club will be credited with the discovery. 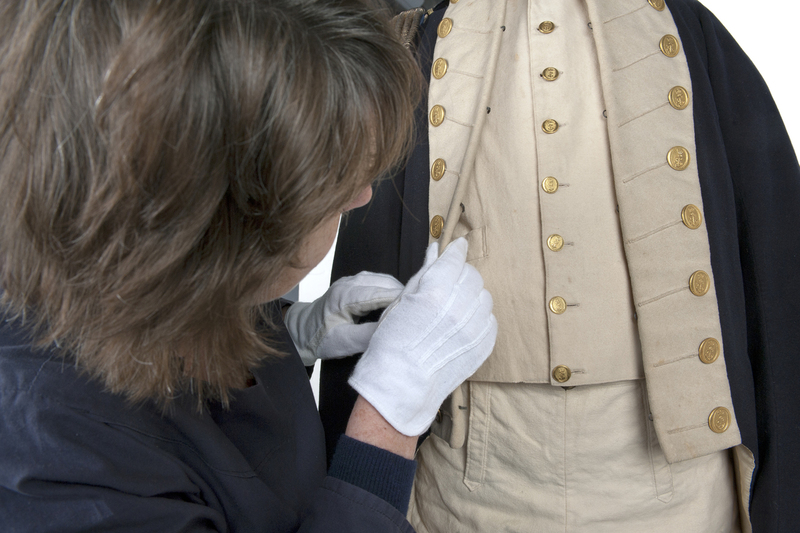 Meanwhile, members of The 1805 Club are to be given the rare privilege of seeing Hicks’ uniform undergoing conservation and the arrangements will be announced shortly. 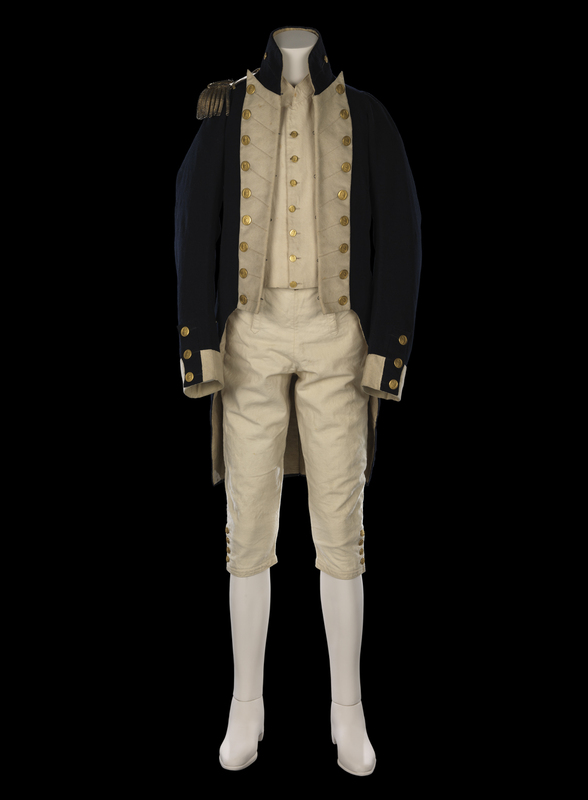 I wonder if Nelson ever met Hicks? Courtesy of the 1805 Club. 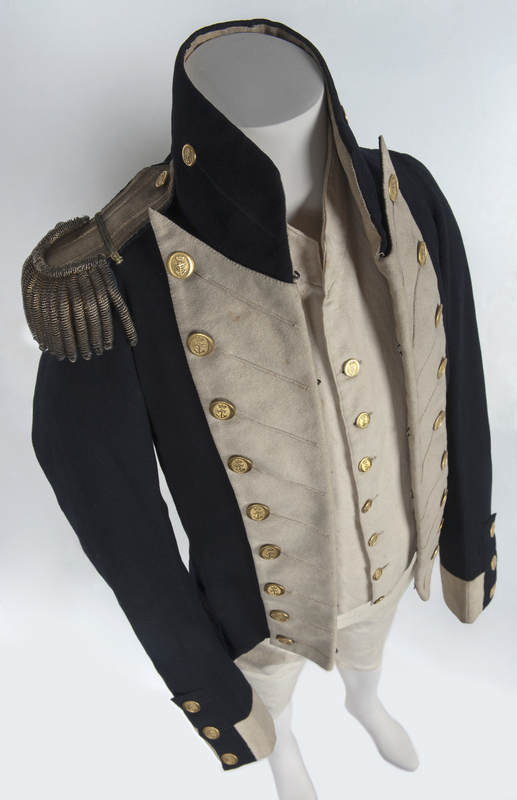 This uniform belonging to Lieutenant William Hicks is the only known surviving example of a Royal Navy lieutenant’s uniform from the Napoleonic Era (1812-25 regulation pattern). Courtesy of Peter Warwick and The 1805 Club. 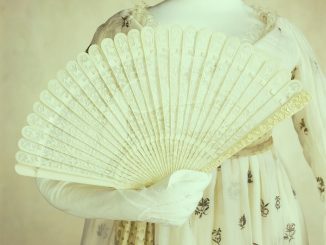 The hottest fashion trends of 200 years ago!